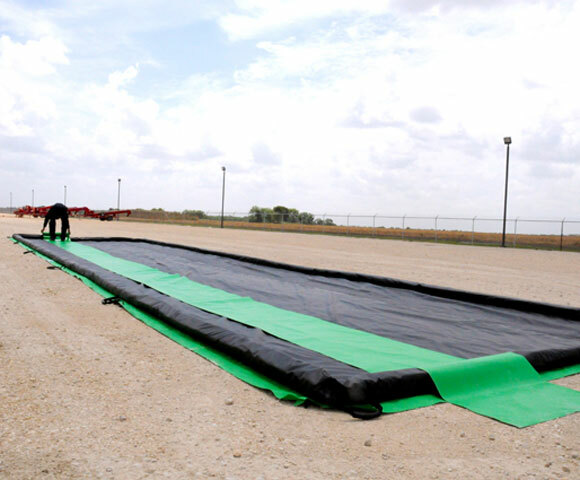 Designed with transportation in mind, Drive Through Berms offer a safe and reliable containment area for tankers, drums, vehicles, frac tanks and other moving machinery. Featuring aluminum angle side walls and self-rising foam walls, these berms are an easy way to keep equipment contained for the duration of their storage use. Berms are made in typical sizing shown below, as well as in custom sizes required by the customer. Please do not hesitate to contact us with a specific design, size or storage request. Additional sizes and fabrics available, please ask! As mentioned above, the design of the drive through berm uses aluminum angles along the side walls and self-rising foam on the two ends. Angle walls will sit standard at a wall height of one foot (1 ft), while foam walls will slowly rise to one foot if the areas fills with liquid. This allows the containment berm to self-adjust as required for your location. Installation for these berms will be similar to the aluminum angle berm, requiring placement and installation of angles along the side wall. All angles use an L-bracket design that slides underneath and along the side wall of the berm. Each wall using these brackets will feature built-in pockets to hold the angle during storage. Similar to our other drive through options, these multi-purpose berms are able to quickly move items in and out of the containment area. This provides locations with a quick option for getting their trucks, machinery or other vehicles contained. All berms feature a fabric that is rated to handle short-contact with specific liquids. Depending on the concentration and makeup of your liquid, different fabrics may be able to work better than others for your site. Foam Wall Berms: The foam wall berm is an easy way to catch small leaks and spills that occur while working on or with various vehicles and machinery. 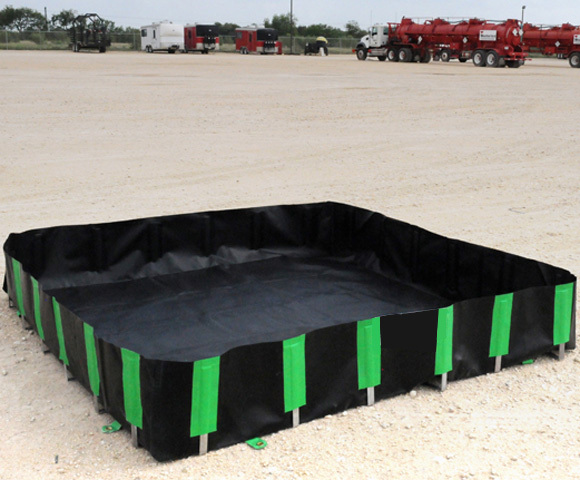 These berms can be quickly placed in needed locations to contain your spills. Regardless of which product you use for your location, these containment items are designed to help keep sites in compliance with local or federal regulations for hazardous material storage.